Screen shots below should give you an idea about the program look and feel. To make learning curve as flat as possible we decided to use only standard Windows controls and well known multi document interface. Once you are done with the screen shots, select preparing solution to learn how the dialog windows shown here can be used. This is the main program dialog, where you define the solution. 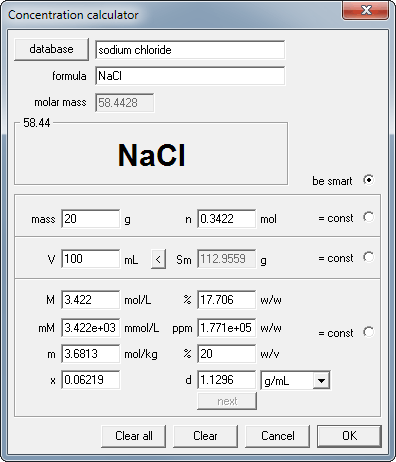 Substance parameters can be entered manually or selected from the database, concentrations can be entered, or calculated using concentration calculator (see below). 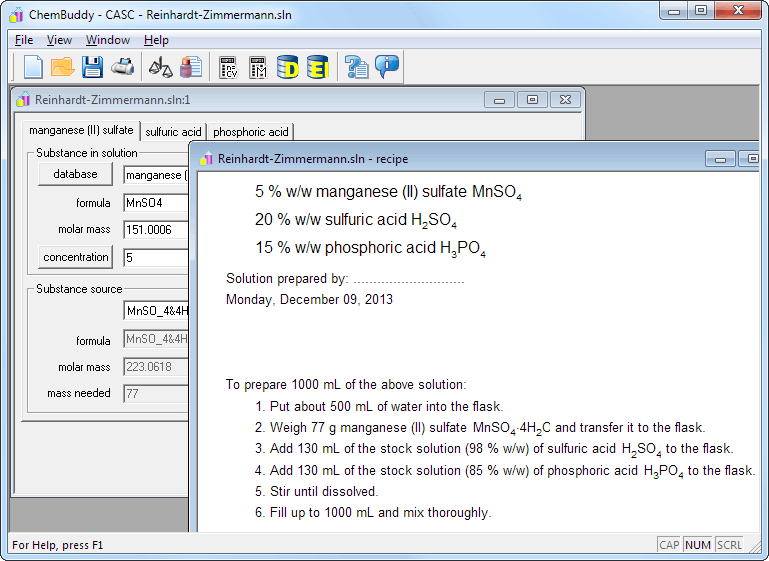 This is whole program window with solution dialog and recipe view - recipe can be printed for further reference. 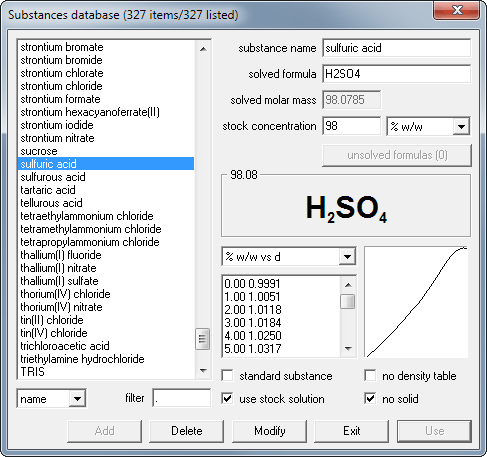 Database window, where you can select substances for your solution. Density plot helps mostly when editing density table. Registered version contains over 300 compounds and can be modified at any time. 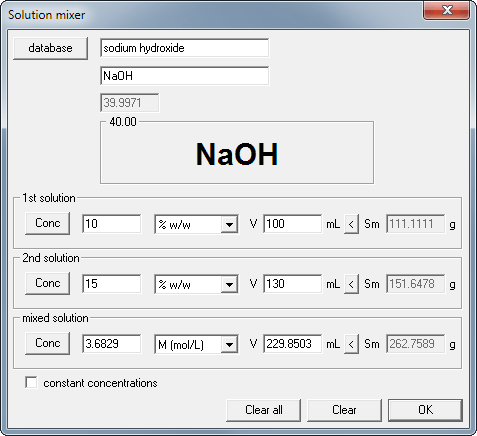 This is the solution mixer used for dilution calculation and for solution mixing. 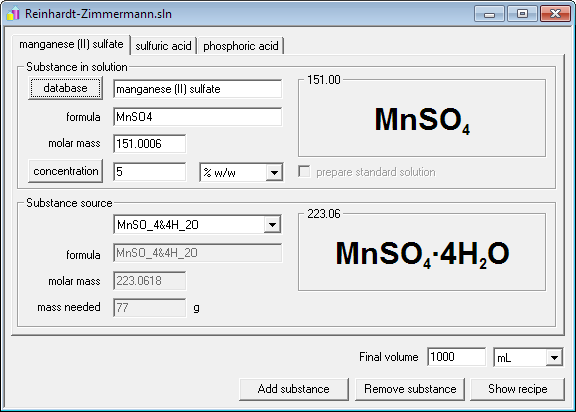 Note that not only solution volumes, but also solution masses are displayed by the program. In fact you have always a choice, whether you want to enter amount of solution as mass or volume. This is only a fraction of program features, feel free to browse the site to see more, or to download the free 30-day trial to try CASC by yourself. You may also download just CASC help file in Windows chm format.